Discontinued and obsolete old bathroom colours. Plastic vanity cupboards. Wall storage. Mirrors. Colour wall cupboards for the bathroom. Mirrored doors and shelves store and hide toiletries. JSL Bathrooms. JSL BATHROOMS. Bradford. Yorkshire. Vanity Cabinets In Colours. Bathroom Storage Solutions. We stock bathroom vanity cupboards and cabinets in discontinued and obsolete bathroom colours. All are of original manufacture in the original colours. Some with mirrored doors to store and conceal your toiletries. Available in various greens, blues, browns, pinks, and beige. Plastic British made bathroom storage solutions. Please email us to check stock. 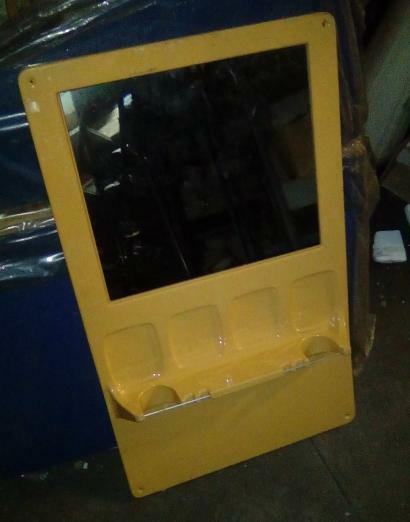 COLOUR PLASTIC BATHROOM VANITY MIRRORS. TUMBLER HOLDERS and TOOTHBRUSH HOLDERS. Pictured. Sun King Bathroom Wall Mounted Mirrored Vanity Shelf. With Tumbler and Toothbrush Holders. For Illustration Purposes. Many MoreColours Available.